I hope it's been evident in spite of my rare posting, that I am in love with bicycles and riding bikes. 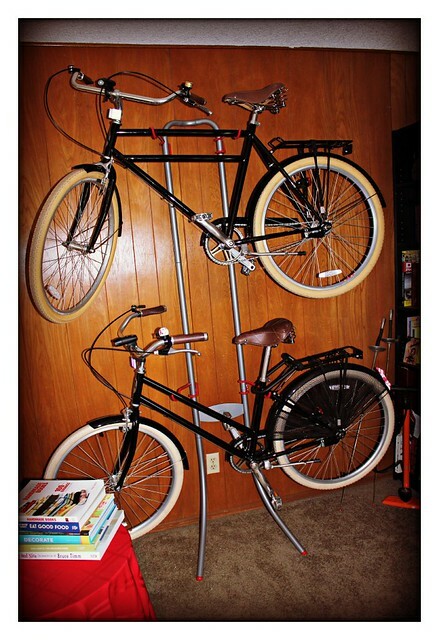 Since acquiring our fancy bikes this summer, Matt and I have been dealing with having to keep our bikes in the living room. They've been blocking our bookcases, actually, and have been the primary element in our decor, whether we appreciated it or not. Lucky for us, all that has changed now, with the Michelangelo Gravity Stand. 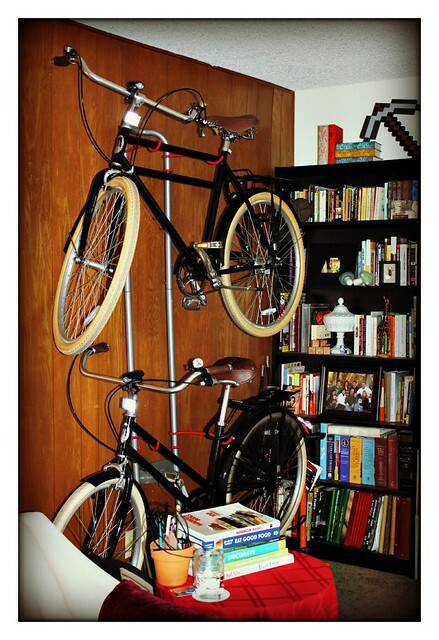 Sure, the bikes are still an unavoidable key part of our decor, but at least we can reach the books now! This rack is so fantastic for us as apartment dwellers. It requires no drilling into walls and holds the bikes as close to the wall as a couple cruisers can get. LOVE! Highly recommend.